As most of you know, I’ve been holed up in Bamako, Mali for the past couple weeks waiting the painful Malian bureaucratic system to push through some paperwork so I can get started on my secret (not so secret if you follow me on facebook or twitter) project. And while I’d be lying if I didn’t find myself somewhere between completely bored and destroying my liver most days here it also has been really great in that it has given me ample opportunity to work on the next issue of my travel magazine. This issue is one of my favourites because it covers such a wide variety of locations. Moreover, it has the theme of adventure which is rarely a boring topic. 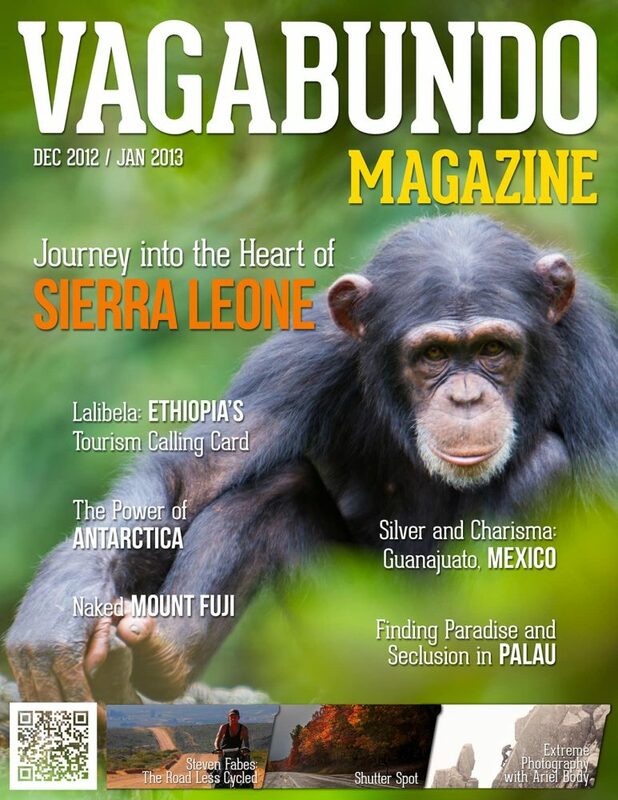 My article from Sierra Leone is the cover story, and as you can see from the cover to the right, I’ve upheld my promise that I was going to put myself on the cover of every issue of the magazine. Beyond my own piece we have some great articles from Japan, Palau, Mexico, and Ethiopia. We also feature some beautiful photography from Antarctica, Canada, and The US. Moreover, we feature the beautiful work of photographer Ariel Body who tells us about how she goes about adding a sense of adventure and thrill to her images. Anyways, as I mentioned, I’m thrilled about this issue and hope that you’ll like it. All the information on how to grab yourself a copy is found on the actual travel magazine page which can be reached by clicking here or on the cover of the magazine to the right. If you’re still not sold on the magazine, I recommend you have a look at the preview below. Cheers! Cheers Maria! Glad you like this issue of the travel magazine! Great job Brandon! I will be gettin it! Ok I misspelled ur name, I mean Brendan! Lol ! No worries Sasha, I’m used to the misspelling haha. Hope you are well.